Random Touch - "A Parade Of Dusty Hobos"
Swirling together a blend of free jazz, electronic atmospherics, classical avant-garde, and even touches of acid rock, Random Touch returns with their fourth release, A Parade of Dusty Hobos. Parade is a departure from 2002’s Hammering on Moonlight in that regular members Christopher Brown (on drums) and James Day (on keyboards) are joined this time by guitarist Scott Hamill. Leaving behind the strange, dadaesque vocals of their previous album, this time Random Touch creates an entirely instrumental work. This reminded me often of the mid-nineties fractalized experimentation of King Crimson (such as the Projects boxed set), though more atmospheric in nature. Random Touch also stays true to their name, focusing less on a pulsing rhythmic structure, and more on random directions of sound that take the listener down totally unexpected sonic pathways, like driving along backwoods country roads past abandoned auto repair shops, into a deep and shadowy landscape of lost thoughts and hypnotic dreams. As with Hammering on Moonlight, A Parade of Dusty Hobos skirts the boundries of the urban world, with its sometimes intense, jazzy explorations, but more often than not, Scott Hammil’s twangy, psychedelicized guitar work adds a different feel to the duo’s music, lending it a touch of rural mysteries, like sitting on the porch of an old farmhouse with a ghostly storyteller, looking out through the tangled branches of dark trees at the night sky and marveling at its complexity. While you may scratch your head at my colorful descriptions, it really is the only way to describe the music of Random Touch. 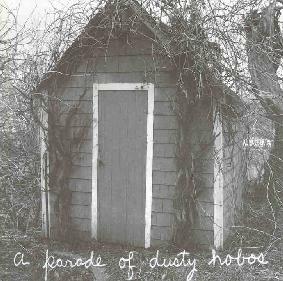 A Parade of Dusty Hobos is a mesmerizing, deeply impressionistic, and definitely challenging listen. Contact via snail mail c/o Roadnoise Productions, LLC; PO Box 1683; Crystal Lake, IL 60039-1683.